Uglyworld #1551 - Quiraing Conquerors (Project TW - Image 144-366), a photo by www.bazpics.com on Flickr. Sometimes I thinkers that we should justs ignores the ideas that Baz and Mireille comers up with to does while we is away on holimadays. Todays was a perfecters exampler of whats I is talkerings about, as they cames up with the ideas to climbers rights up to the very tops of the Quiraing, which is a biggers lumper of grass covereds rock that can be findereds near the tops of the Isle Of Skyes. 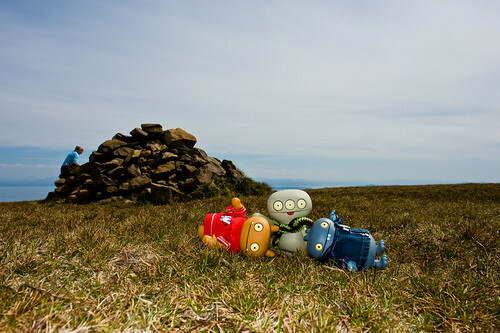 When we finally reachereds the tops we findereds a coolers rockers cairn at the summit, and then almosts immediatelies boths myselfer and Babo collapsereds in a heap, with Cinko keeperings a closers eye on us justs incasers he hads to calls for a mountainers rescue uniter! Thankfullies we all survivereds the ordeals, buts we is wonderings what madnessers has been plannereds for Thursdays!